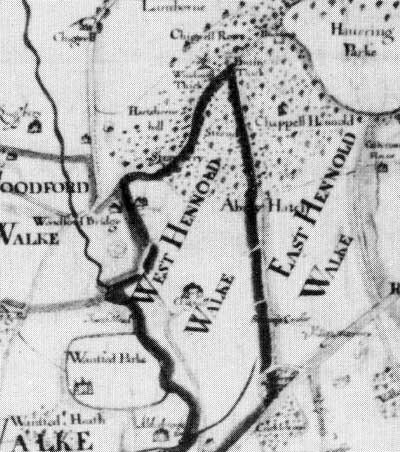 Following the Perambulation of the Forest of Essex in 1641 in the reign of Charles I the exact boundaries of the forest were established - the River Lee formed a natural boundary in the West, with the highway from Bow bridge to Ilford and the Whalebone Road the Southern boundary and a series of stones formed the Eastern boundary. The forest was bisected by the River Roding from Passingford Bridge north of the Richard Stone to Ilford. It was a natural division and each half became known as Waltham Forest and Hainault Forest (coloured green on the map). 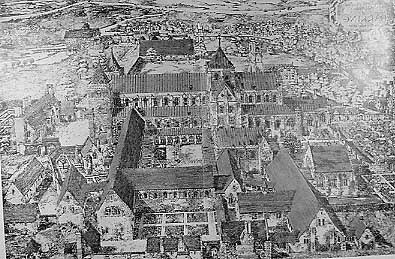 To the south of Ilford lay a huge monastery known as Barking Abbey and they enjoyed rights to deer and wood for building and heating from a woodland of some 3,000 acres on the edge of the parish of Barking hence Barkingside. At the Dissolution by Henry VIII the woodland became the King's own property within Hainault Forest which was still subject to Forest Laws. The woodland became known as Kingswood and following disafforestation in 1851 the woodland was cut down becoming Crown property and farms were set up. P. H. Reaney (1935) in his book "The Place-names of Essex" and W. R. Fisher (1887) "The Forest of Essex"
In late Victorian times Hainhault appears on maps and texts. Reaney concludes that all the above spellings come from the roots higna and holt. "The modern spelling is due to a fictitious connection with Philippa of Hainault or Hainaut in Belgium, queen consort to Edward III"
The map shows the extent of the Kings Wood from Barkingside, to Collier Row and Padnall Corner. 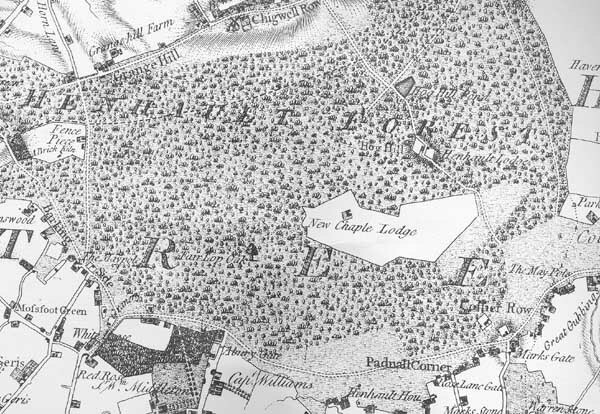 Note Mossfoot (Mossford) Green, Hog Hill Pond, Henhault Lodge and the location of the Fairlop Oak tree. "The Hyneholt" in Manford Way, Hainault, formerly "The Alfred's Head". The proprietors are to be congratulated on choosing a name change in keeping with the area, rather than something inappropriate as is usual. The spelling is that used in 1239 long before Queen Philippa came on the scene.